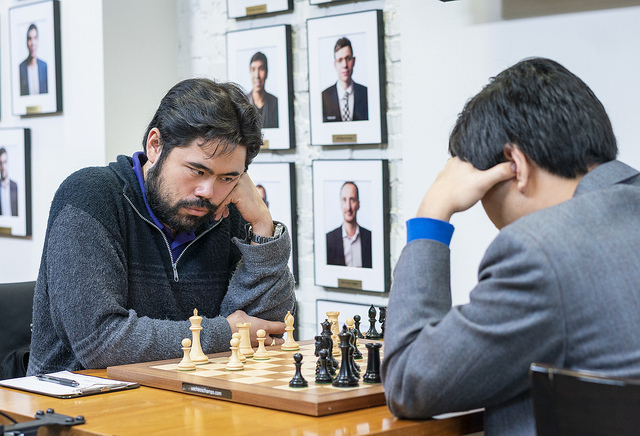 Wesley So and Jeffery Xiong took advantage of a shaky start by maverick Timur Gareyev to grab two of only three wins in the first two rounds of the 2019 US Chess Championship. 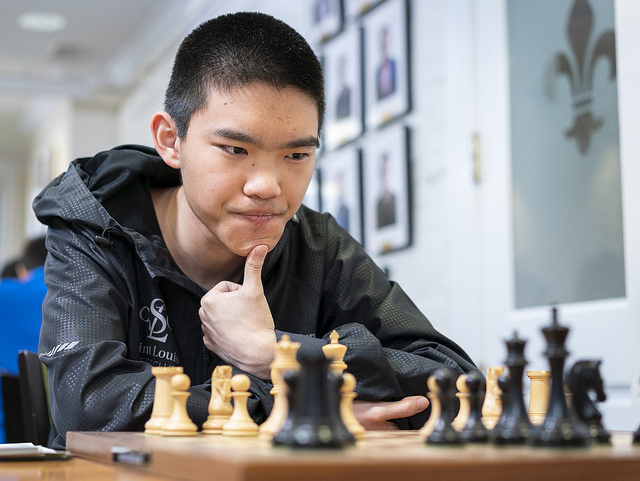 The other winner was 18-year-old Sam Sevian, who continued his excellent form from the World Team Championship to overcome stiff resistance from the youngest player in the field, Awonder Liang. 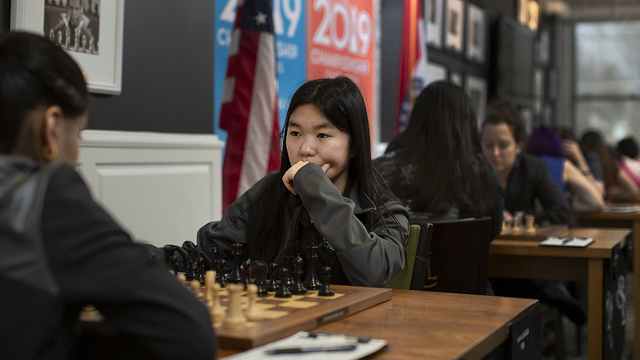 In the Women’s Championship Carissa Yip and Jennifer Yu lead, with Carissa benefiting from Akshita Gorti resigning a position where she stood no worse. 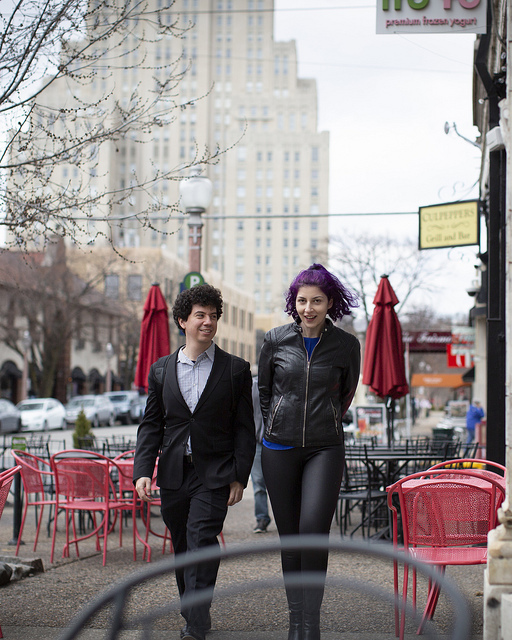 The main event of the US Chess Championship got off to a slow start on Wednesday, with 11 of the 12 players seeing their chances of winning the $64,000 Bobby Fischer prize for an 11/11 winning streak go up in smoke. 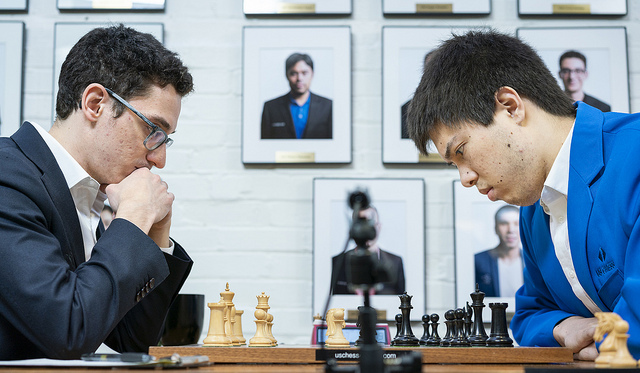 The draws included the big clash between Hikaru Nakamura and Wesley So and also Fabiano Caruana against Sam Sevian choosing to play the black side of the Sveshnikov he championed with White against Magnus Carlsen in their World Championship match. 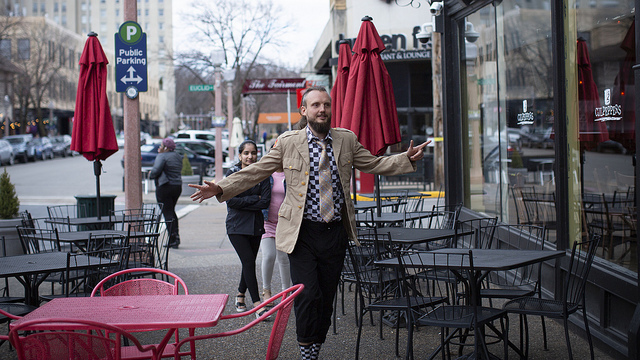 Liang-Lenderman was a wild encounter that eventually ended with Alex Lenderman frustrated in 120 moves, but the ice was broken by Jeffery Xiong… or perhaps we could say by Timur Gareyev. The lowest rated player in the field was always the most likely to entertain the crowd, but spending 20 minutes on 6.g4!? and then 39 minutes on 8.Bb2, a move he later admitted he could just as easily have played instantly, was asking for trouble. 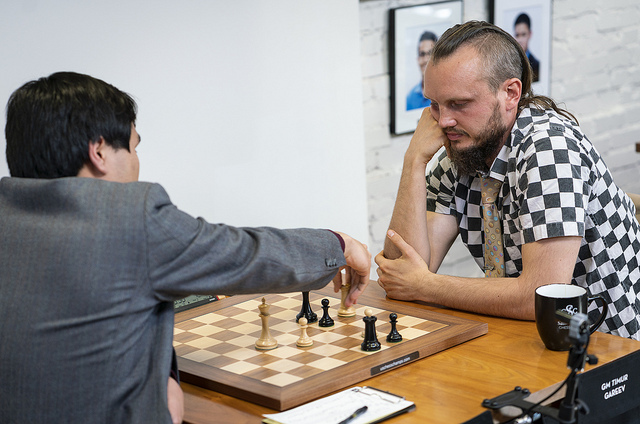 White’s position had its trumps – more space and the bishop pair – but in time trouble Gareyev lost the thread when former World Junior Champion Xiong began to ask uncomfortable questions with 19…a5! White has weaknesses on h2 and e3, which he defended with 20.Qf2? !, but after 20…axb4 21.axb4 Rxa1+ 22.Bxa1 Qe4 the new weakness on b4 was the straw that broke the camel’s back. 23.Bc3 was an attempt to hold things together, but after 23…b6! White’s position crumbled fast. In Round 2 at one point it looked like we might get no decisive games. 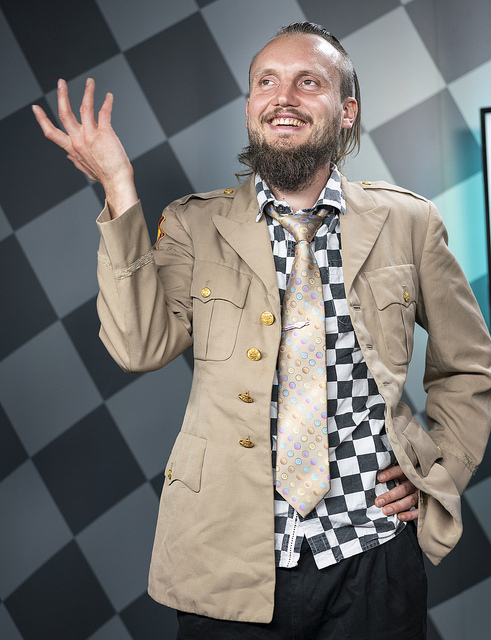 Lenderman-Nakamura fizzled out in 30 moves, Varuzhan Akobian survived desperate time trouble against Xiong, Leinier Dominguez mistimed a g6-stab against Shankland and we could have been reduced to only discussing the aesthetics of the bishop dance in Caruana-Robson. ...or on c4, d4, d5 and e5 as they were just four moves later? As you can see, though, Akshita Gorti instead simply resigned. That was perfectly understandable, since 24.Qc1 Bxb1 looks hopeless (25.Qxb1 Rxd2), but in fact after 25.Bf3! there it’s White who’s on top! 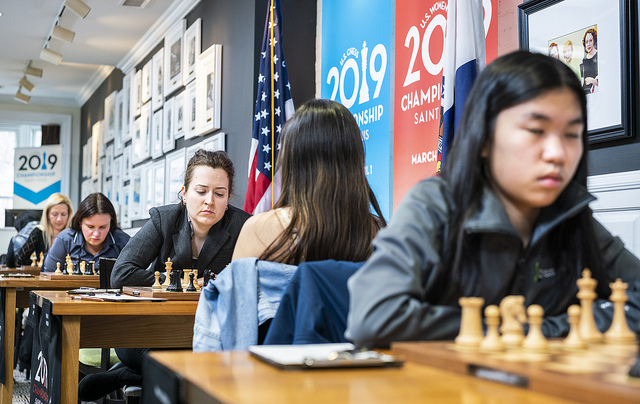 Top seeds Irina Krush and Anna Zatonskih are among those just half a point back, with Irina needing to find one of the moves of the event to turn around a bad position against Emily Nguyen in the first round. 39.Rxe3!! and if 39…Qxe3 there’s 40.Qd6!, and despite temporarily being a rook up Black can only prevent mate at the cost of a huge amount of material. Emily played 39…Qf2 instead, but resigned after 40.Qe8! Qf4+ 41.Kg1.